LiveCode LessonsGetting Started with LiveCodeGet Up and Running with LiveCode Legacy Android Prerequisites (pre 8.1.5)How do I Become an Android Developer on a Mac? This lesson describes the basic steps you need to follow in order to start up as an Android developer using an Apple Mac. System configuration information and screen captures are provided. Note: It is assumed that you are familiar with the installation process of an Apple operating system and LiveCode. Please make sure these are installed before you commence with the remaining steps of this lesson. The following steps run you through the software installation process that you would typically follow on a Mac. Newer versions of MacOSX do not come pre-installed with the required JDK. You can download it from: http://www.oracle.com/technetwork/java/javase/downloads/index.html. Navigate to the download link that is specific to your operating system and select the download link. You may get the kind of download dialog that is shown in this step. Save the file to your file system, execute it and follow the installation steps that guide you through the installation. Navigate to the SDK Tools only download link that is specific to your hardware platform. You may get the kind of download dialog that is shown in this step. Save the file to your file system. 1. 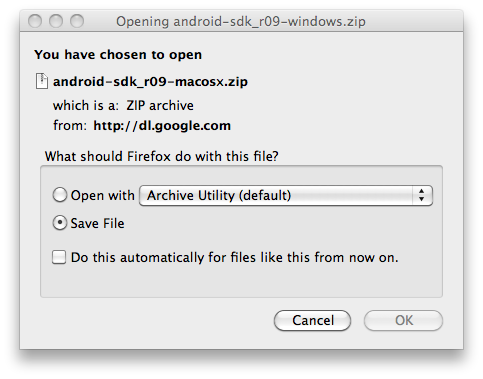 Use Finder to navigate to the location into which you downloaded the Android SDK zip file. 2. Double click on the file to extract it. 3. Move the extracted package into a location that is to store the Android SDK. 4. 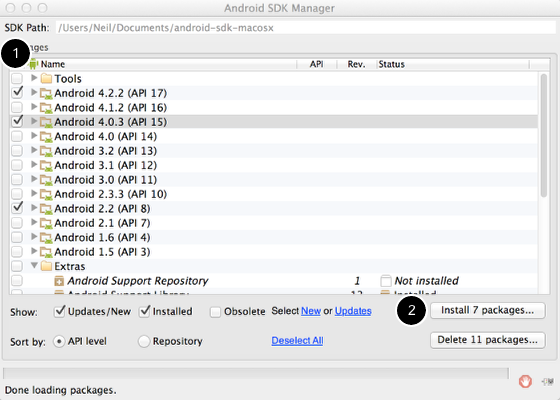 Navigate into the package that was moved and locate the file android-sdk-mac/tools/android. 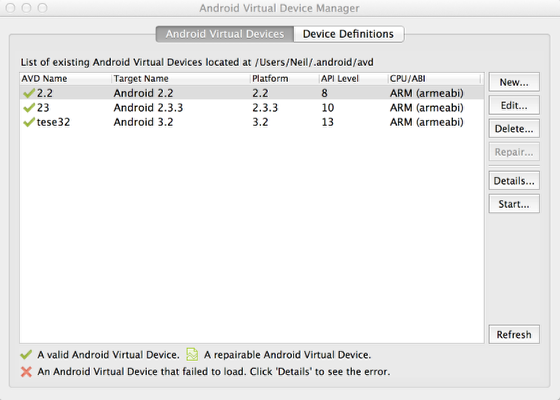 The main dialog, shown in the figure of this step, is the Android SDK manager. The Android Package Installer lets you select the packages you would like to install in your Android development environment. By default, only a few packages are selected. From this version of the SDK I would recommend keeping the default selection. Please make sure that you also have checked the latest "Android SDK Tools" and "Android SDK Platform-Tools" from the "Tools" dropdown. 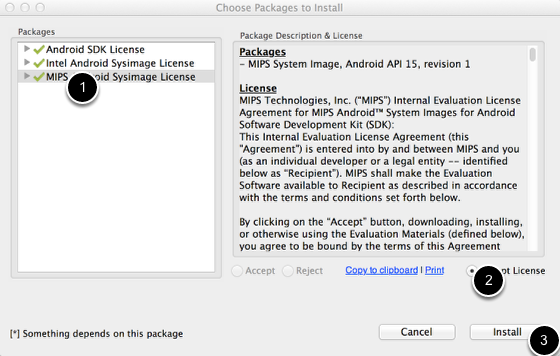 Ensure that you install the SDK Platform Android 4.0.3 package. 3. Choose the Name for your virtual device. 4. Set the Target an installed Android API. 5. Fill in the SD Card Size. 6. Optionally enable Snapshot. This speeds up the launch of the emulator. 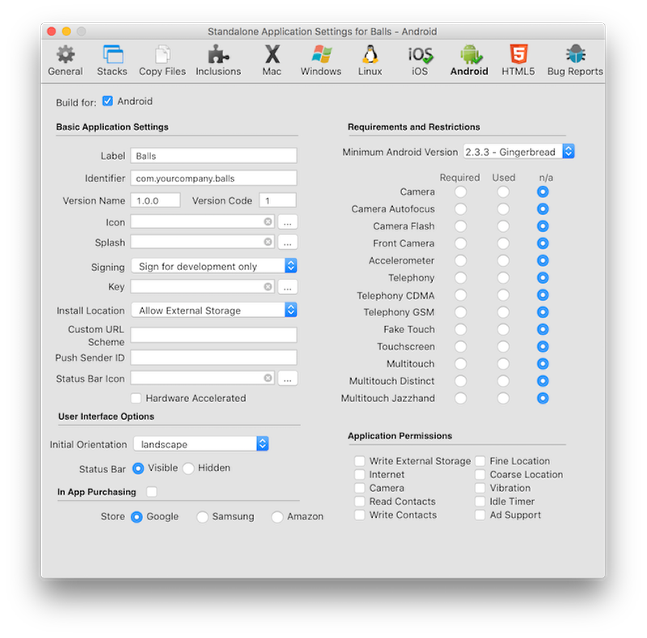 Launch the LiveCode IDE and select LiveCode -> Preferences to launch the Preferences menu. Then select Mobile Support and you are presented with the dialog shown in this step. This dialog allows you to configure the path to the Android SDK root, which you should already have installed. Select ... under Android SDK and choose the directory containing the Android SDK root. This indicates that the path you specified is not pointing at the Android SDK root. You may have to navigate one level deeper into the directory hierarchy to access the root directory. The root directory may look something like: ...android-sdk-mac. Note: Inclusions, Copy Referenced Files, Bug Reports and Stacks features are not available when building for Android. Use the CopyFiles feature if you wish to include multiple stack files in your application. Ensure the emulator is running or an adequately configured physical device is connected before trying to test your code. Then select a device from the LiveCode IDE from Development -> Test Target. Your Test icon on the main pane of the LiveCode IDE should now be active and allow you to deploy your LiveCode application. NB When deploying to a device, you may receive a "INSTALL_PARSE_FAILED_INCONSISTENT_CERTIFICATES" message. All this means is that there is currently an application installed on your device that has the same identifier as the app you are trying to deploy. This can happen if you are working on a specific app across multiple development machines. Prev: How do I Become an Android Developer on a PC? Next: How do I become an Android developer on Linux? When I select the directory for the Android SDK I receive an error message. Click the following link to see the images and error message. 2) In there should be a sub folder named platforms and a sub folder named platform-tools. Within the platforms folder should be a folder named android-8. Create a new folder in the android-8 folder and name it "tools". 3) Copy the contents of the platform-tools folder (located at the base of the SDK, next to the platforms folder) into the newly created tools folder. I followed your advice and was able to link to the folder. However, after selecting the ANDROID option, I attempted to TEST the program. When I did the TEST I received the following message: UNKNOWN DEPLOYMENT PLATFORM. To test with a physical device, you need to make sure your device is connected and you have selected it as the test target. To do this, select your device in the Development -> Test Target sub menu from the IDE. To test with the emulator, you need to have created a virtual device (see step Configuring a Virtual Device), have that device running in the emulator (see step Starting the Virtual Device Simulator) and have selected that device as the test target. As above, to set the test target, select your device in the Development -> Test Target sub menu from the IDE. For more information, see the step Running Under Android. Thanks Michael, your tweak worked a treat! I have followed the instructions and have the emulator running. When I go to the Test Target menu, my emulated device does not appear as an option. 1. 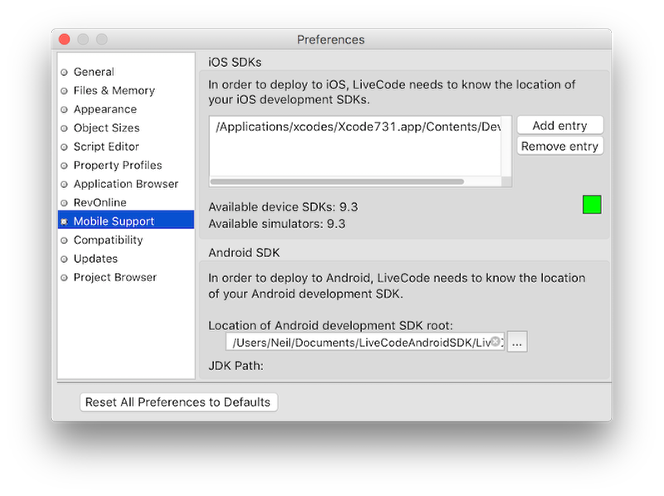 The path to the Android SDK has not been configured in the LiveCode Preferences. 2. The emulator is not registered with LiveCode. You can address point 1 by following step "Configuring LiveCode for Android Support" in this lesson. Point 2 can be addressed by closing the emulator and LiveCode down. Then start the emulator and wait until it is up and running. Next start LiveCode. The emulator should now be accessible. why are you using the windows version of the SDK install etc for a mac? This is of no use to a mac user if you want to run an emulator. Or even just setting up a real device. indeed. Thank you very much for spotting this. The images in the lesson have been updated. "chosen folder is not a valid android SDK folder"-error. You need specify the path where the sdk-manager's .exe file is. So just check it's location from the sdk-manager-icon from your desktop. It's in C:/users/yourname/AppData/Local/Android/etc... The "AppData" folder is hidden. So just copy paste the address to LiveCode directly from the address bar. Has something changed with the newest downloadable version of Android? The filename listed above ("android-sdk-mac_x86/tools/android") does not exist. I am encountering a similar problem to the first question here and I've tried doing the solution outlined in the second response. It keeps telling me an error of not being able to identify the 2.2 SDK. I am currently using 5.5.3 Livecode with the latest andoid SDK bundle dated December 2012. Please help as I am gradually loosing interest in learning. Setting andoid application development setting is kinda tricky and iOS is far trickerier than this. I just downloaded the latest Android SDK and /tools/android still exists in the SDK directory. Maybe try to install it again. I downloaded the ADT version and then copied and referenced the SDK directory in that. You can start the SDK manager by running the file: "/tools/android" in your SDK package. Hanson you are an angle! Worked like a charm when I tried it on my macbook! For some unknown reason it did not complete the installation on my 7 year old iMac! HELP. I followed your instructions. When I tried to run in the emulator I received this message: Unable to build app for testing: debug certificate has expired, please refresh. as the messages states, your debug certificate has expired. If a certificate does not exist, then Android automatically creates a new one for you. So all you have to do is delete the one that has expired. As a safety precaution, I would strongly advise to keep a copy of anything you delete though. You have to delete the "debug.keystore" file. This is located in your android development environment. Possibly located somewhere like: "~/.android". there have been some reported issues with linking to the Android SDK from with LiveCode 6.0. This issue has been addressed with LiveCode 6.0.2-rc-1 and later. Every time I try to create a virtual simulator, the program hangs and becomes unresponsive. Is there a work around? when you refer to "the program", I assume that you are referring to the android AVD manager. I've done all the stages and they've worked how it says, but the test button is still ghosted. What have I done wrong? From the menu bar, select the following: "Development -> Test Target"
If everything worked, then you should be able to select the target you would like to deploy to. The target name should be in black characters. If the target name is grayed out then you have not set up the standalone options to deploy to Android. If the target does not exist, then you have not started you Android simulator or a devices is not detected. Indeed I got that black-screen on 2.2 but it went fine one 2.3.3. Thanks. thank you very much for the comment on our lesson and great you got it working. It is a bit disconcerting that you are finding that the android application is crashing. From your description it sounds like this may be an issue with the emulator, as other apps are crashing too. If you feel that the issue is related to LiveCode, then please feel free to launch a bug report a quality.runrev.com . This would allow us to investigate LiveCode problems further. Hmm. Now Feb 2017 and looks like Google has pooched this. I'm running on Mavericks, using LiveCode 8.1.2 and have got a bunch of Android SDKs according to the SDK Manager---7.1.1 (API 25), 6.0 (API 23), etc.---but I can get none of them to be recognized by LC, even with the tools link added (as suggested in the comments). Perhaps it is my setup, but I can't seem to get this linked in at all. Thanks in advance .. mark.